These Small Gerber Daisies - Peel N Stick Dorm Decor are so cute you'll want to start talking to them - and then - you'll graduate from college as a flower whisperer. How cool would that be. Start your flower whispering practice now by adding this dorm safe Small Gerber Daisies - Peel N Stick Dorm Decor to your college dorm decorating supplies. As a college decoration, this Small Gerber Daisies - Peel N Stick Dorm Decor is about as easy as they come. 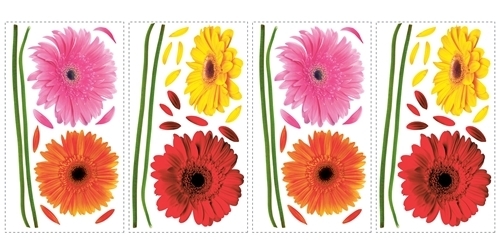 This Small Gerber Daisies - Peel N Stick Dorm Decor simply sticks on like a sticker, and peels off without ripping off dorm wall paint or leaving sticky residue. This Small Gerber Daisies - Peel N Stick Dorm Decor is a college decor accessory that every girl will love. Add it to your dorm gift shopping list and enjoy giving your college girl something that will brighten up her dorm room. 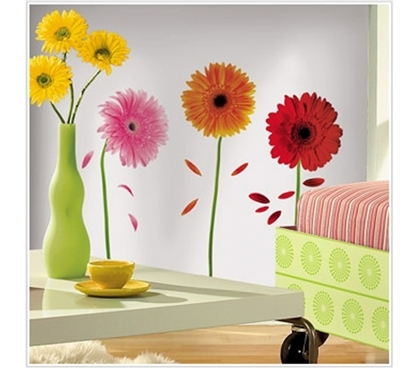 This Small Gerber Daisies - Peel N Stick Dorm Decor makes adding color to your dorm room easy and fun!